Last July I first laid my hands on the then-dubbed Dash GPS navigation beta unit while visiting friends in San Francisco. As I was with a friend that had just moved there and was not familiar with the roads, the Dash proved indispensable. Naturally, so would any GPS navigation device - not quite. 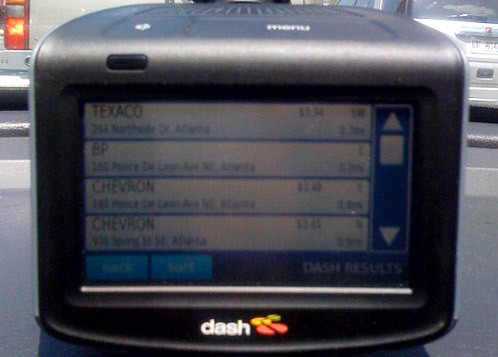 The revamped unit, now called the Dash Express, changes the way people think about GPS navigation. The Dash Express has an Internet connection and is all about two-way communication. A full review will come in the next few weeks after I get final projects out of the way but I just wanted to say that I am quite happy with this little device. The Internet connection is fully utilized when grabbing information from Yahoo! Local, which is the key selling point of the Dash Express for me. Others might buy it for the fancy live traffic data via the Dash Driver Network. The Dash Express finding cheap gas locally through Y! Local. Earlier this evening I unexpectedly put the Dash Express to the test. My roommate purchased a car on Craigslist today. The car kept dying on the road and we were only a mile from our house, albeit in the middle of rush hour in downtown Atlanta. I used the Dash Express to find the quickest and least congested route. That route had construction that the Dash Express did not yet know about so I just kept driving and it was able to recalculate a route that worked. Unfortunately, the car did not work after a timing chain skip killed the block for good. 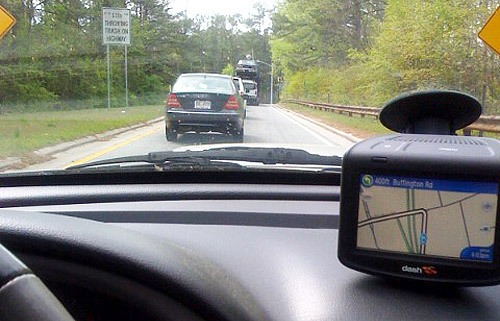 Do you use any GPS gadgets in your car?